I have lots of stuff to share with you today. Do any of you remember a few months ago I mentioned that I was invited to be a guest designer on the Cricut Circle blog?? 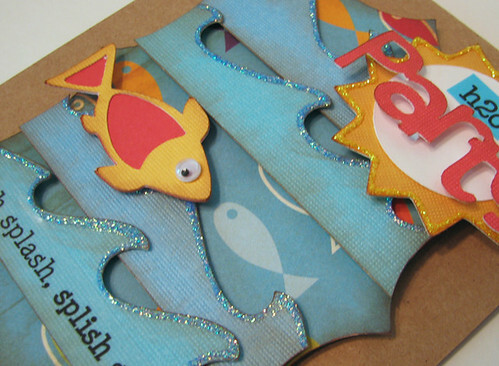 How many of you are members of the Cricut Circle and had a chance to see my feature in June?? 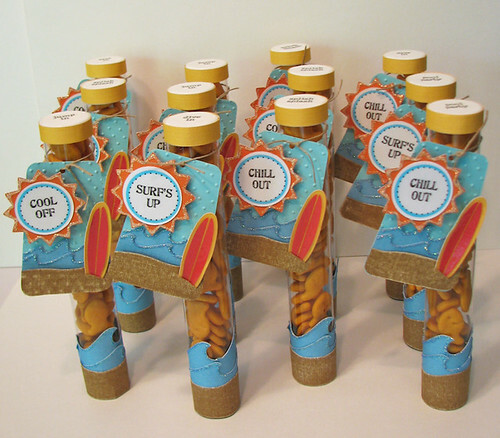 For those of you who didn't get a chance to see my beach party ideas, I wanted to share them with you today......before the end of summer. I got to combine the love of my Cricut Expression with the wonderful SRM Stickers for all of the projects below. 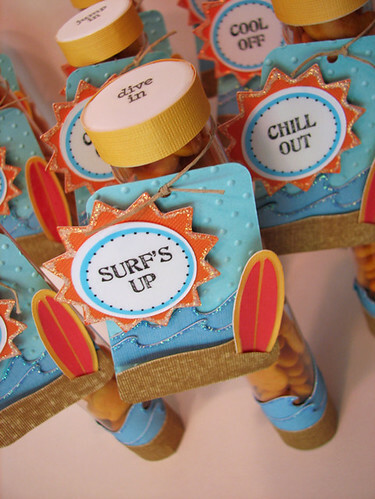 I used the Life's A Beach cartridge to cut the waves, Graphically Speaking for the fish, Create A Critter for the sun, Birthday Cakes for the word 'Party" and Gypsy Wanderings for the label. The patterned paper is from Cosmo Cricket and I added some fun stickers from SRM Stickers and accents with Stickles glitter glue. I used the Life's A Party cartridge to cut the waves and the surfboard and the Create A Critter for the sun. 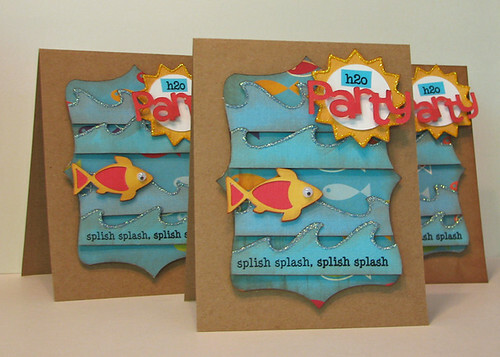 I embossed the background with the Swiss Dots embossing folder and also sanded the tan cardstock for a sandy look. I added some Glossy Accents to the surfboard to make it shine and I added some Stickles glitter glue to the wave and sun cuts for some sparkle. The sentiments are from SRM Stickers. I tied the tags to the tubes with some twine and decorated the lids with some more SRM Stickers. 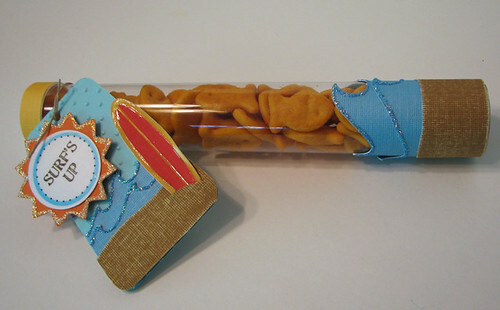 I decorated the bottom of the tubes like the bottom of the tags and filled them up with some Goldfish from Pepperidge Farm. 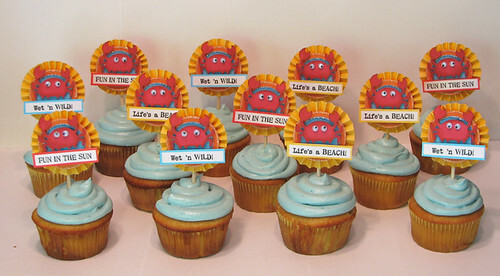 Next up is some yummy cupcakes with decorated cupcake toppers. I created an accordion flower and adhere two layered circles to the front of it. 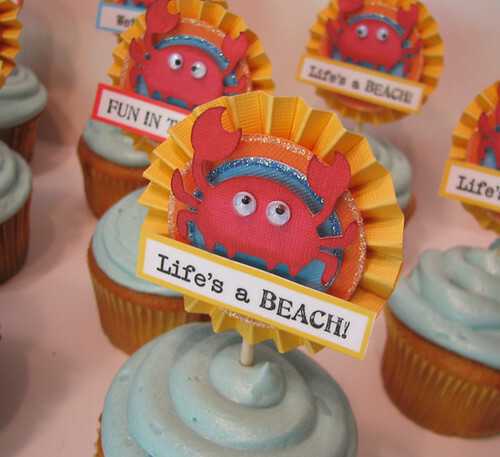 I added some Stickles around the edges and decorated them up with the cute little crab images from Create A Critter. I added some cute little wiggle eyes to the crabs and then added a sentiment from SRM Stickers under the crabs. To stand them up in the cupcakes, I used some skewers that I cut down into thirds and adhered them to the topper and slid them into the tops of the cupcakes. 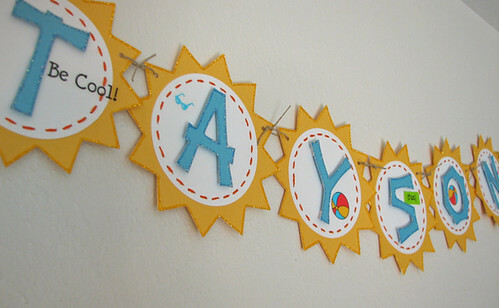 Let's finish off this party with a fun little banner for the birthday boy.......my nephew Tayson. I just cut several suns from the Create A Critter cartridge, layered them with circles and then stitched around the inside of the circle with some embroidery floss. I added some letters cut with the Life's A Beach cartridge and accented the sun and letters with some Stickles. I then tied them all together with some twine and then I finished it off with these cute SRM Stickers. So, what do you think?? Have I inspired you to get creative with your next party?? Which of the projects above is your favorite?? This was a *HUGE* project that I was so happy to do for the Cricut Circle blog. I am not a member, but I saw tons of inspiring projects over there the little while that I did have access as a guest designer. I am busy with the starting of school this week and the end of summer activities for our family. I am not sure how much time I will have to craft this weekend, but I have an exciting week coming up with the new releases at My Craft Spot and a chance to win a prize on my blog. Come back and check it all out. OMG! Amy all of these projects are beyond words! No wonder you were a guest designer over there. What a fun party this would of been! TFS! So cute! I did see these, and loved them! Wow, amazing job! I love all of the details. That looks like it was a lot of work. Great job! Wonderful projects! Love the crab. WOW Amy!!! I just found your blog and all I can say is wow! I'm your newest follower and subscriber. I love this party theme and I've never seen the tubes done before. You're so creative and I love the colors, designs and papers of the whole party theme. Thanks for sharing them with a cricut wanna-be. You speak my "party favor" language! This is my favorit type of project! This very much looked like a ton of work, but you did an amazing job! I love EVERYTHING! Congrats on such a wonderful accomplishment. I love your blog! This is amazing! Great attention to detail and the crabs are adorable! I agree. your work is amazing! TFS! Can I ask where you got the tubes for the party favors?